The E30 generation of BMW 3 Series is a great car. Overrated? Yeah, probably. But they’re fun and iconic enough that it’s now incredibly hard to find one that isn’t rusted, modded, stanced, engine-swapped, raced, beaten to death or some combination of those things. We did find one, and if you want it, it’ll cost you a pretty penny. Up for grabs on German eBay is this European-market 1985 BMW 323i, just like any old E30 you’d find in any city, “...but brand new!” as the seller enthusiastically notes. This example has a mere 260 km on the odometer, or about 162 miles. It is indeed brand new, a very barely driven E30 that’s as old as I am and has the interior and exterior to back it all up. The 323i packs a 2.3-liter version of the famous M20 inline six motor, delivering about 150 horsepower for this model year. This E30 variant was never sold in the U.S. Besides the different engine and a couple options, it’s near identical to the 325e I owned until a few months ago. Just way the hell nicer. 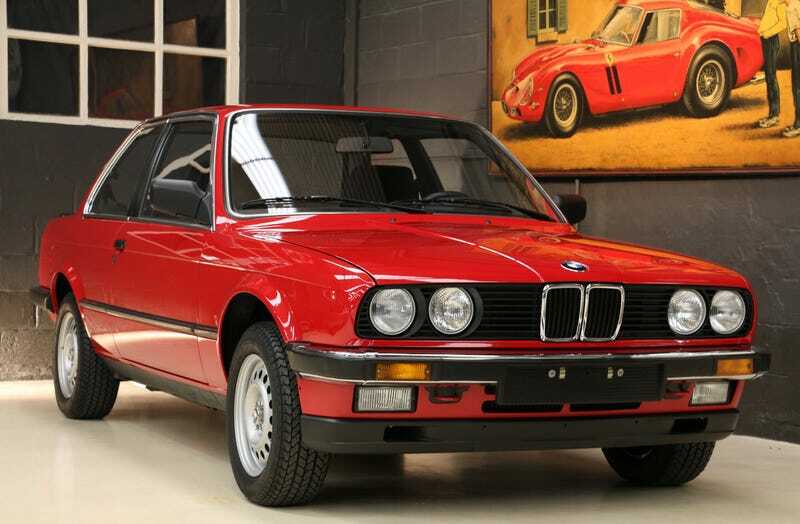 Now given its age, this 323i is legal to import to the U.S., but you have to consider the price tag first: the buy-it-now option is set at 69,900 euro, or about $82,000. And that is a lot! It’s more than any new BMW 3 Series, and probably about what a loaded 2017 M3 will run for. And I’ve seen E30 M3s here in the U.S. go for about that much. It’s a huge ask for an E30 that is admittedly pristine, but far from being an impressive top shelf version. If this isn’t the poster child for how insane E30 madness has become, I don’t know what is. At least it’s cheaper than that M1 from the other day. Just, you know, nowhere near as fast or as cool. What&apos;s The Cheapest E30 BMW M3 Out There?